We need climate solutions now, and we don’t have a moment to lose. We know what is responsible: Fossil fuel corporations like Exxon and Shell have driven the climate crisis. 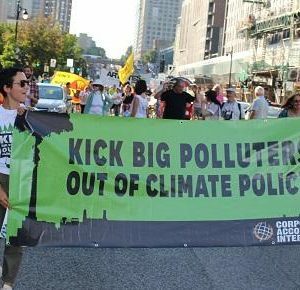 Through concerted disinformation campaigns designed to confuse the public, buy off politicians, and stymie climate action, Big Polluters have rigged our democracy and global policy spaces like the U.N. climate treaty to benefit their own profits — at the expense of people and the planet. But the tide is turning. On November 6, a slew of candidates who are ready and willing to take climate action on behalf of people, not corporate interests, won seats in U.S. Congress. Powered by young people, these leaders, like Alexandra Ocasio-Cortez, are pushing for urgent action on climate. As the next global climate talks approach in Poland this December, we can send a clear message not only to the new House of Representatives, but also to the world leaders gathering there: It’s time to side with people, not Big Polluters, for a just climate future. That’s why we’re joining with 350.org and calling on the newly elected Congress to align their policies with science and their priorities with the moral imperative of this moment. Together with you, we’re calling for real climate leadership in Congress. And we’re sending a clear signal to governments gathering in Poland that people across the U.S. are ready for strong action, regardless of what the Trump administration says. Stand up to the fossil fuel industry: End government handouts to polluting coal, oil, and gas corporations, and investigate Exxon, Shell, and other Big Polluters for misleading the public and wrecking the climate. Support visionary legislation like a Green New Deal to create millions of good green jobs and hasten a just and equitable transition to 100 percent renewable energy for all. Kick Big Polluters out of global climate talks and all levels of climate policymaking. This is a critical moment for our planet, and we must insist that our elected officials be part of the solution. Write to your member of Congress and urge them to be a climate leader.